Railpictures.ca - Steve Bradley Photo: Cold days of winter brings out the glory of steam to its fu;ll extent. Proof positive is CN 6218 making its way north on the Bala Sub, with a train of railfans. Passing under the CPR, 6218 makes a beautiful sight from the shoulder of the Don Valley Parkway. Back in 1965, the DVP was quiet on a weekend, and pulling off for the occasional train picutre was no problem. | Railpictures.ca – Canadian Railway Photography – photographie ferroviaire Canadienne. Copyright Notice: This image ©Steve Bradley all rights reserved. 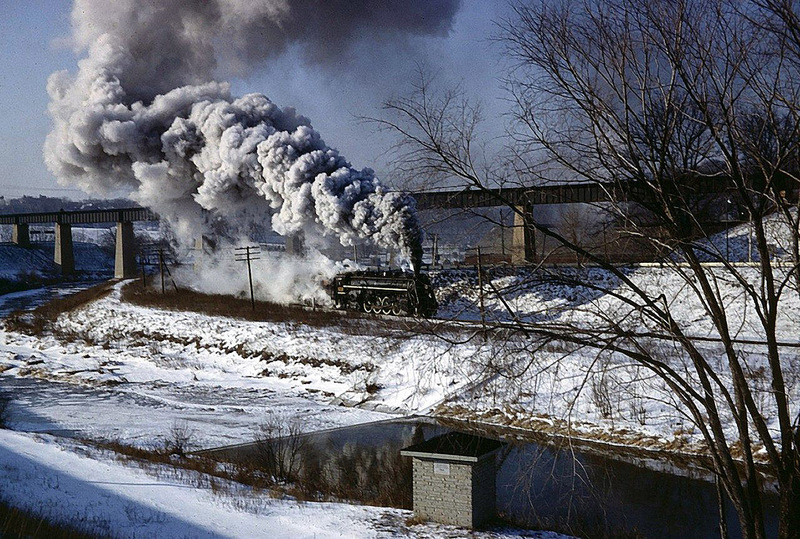 Caption: Cold days of winter brings out the glory of steam to its full extent. Proof positive is CN 6218 making its way north on the Bala Sub, with a train of railfans. Passing under the CPR, 6218 makes a beautiful sight from the shoulder of the Don Valley Parkway. Back in 1965, the DVP was quiet on a weekend, and pulling off for the occasional train picture was no problem. A great picture Steve! This must have been in your early days but you started off as a pro! Awesome photograph, Steve! Congratulations on your Editor’s Choice Award!